• Wear jeans on the Sunday before Denim Day during service and speak about the importance of sexual violence during a sermon. • Create a campaign for individuals to make a small donation to wear jeans on Denim Day at your place of employment. Donate the proceeds to help survivors. • Hand out stickers that show your support of survivors. You can find a sticker template here. 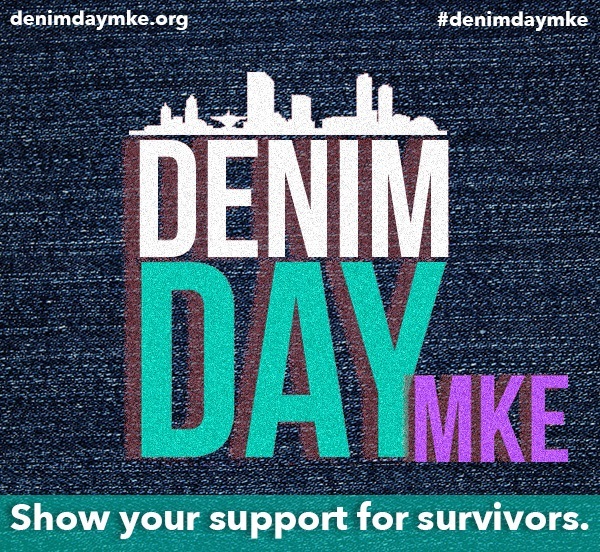 Denim Day is a day to support survivors of sexual assault. 1 in 3 women and 1 in 6 men will be sexually assaulted in their lifetime. Victim blaming, intentional or unintentional is harmful for survivors. Please wear jeans on Wednesday April 25th in an effort to show support to survivors of sexual violence. Hang Denim Day flyers in your bathrooms. The flyers have useful resources for both women and men. Wear jeans in support of survivors and gather for group or individual pictures. Create signs to show your support in the pictures! The persons of influence gallery has some great examples of how this can look. Clean out your closet and decorate your old denim. Use a time during the week when you might have workshops to educate and use your creativity to support survivors and ending sexual violence. Hold a rally in to show support and a unified community. Involve community leaders in your congregation in hosting the event to show support. Display the decorated jeans at the rally. This could be a great way to show off the jeans you decorated, or you can use your creativity to create a unique display showing your commitment to ending sexual violence and supportive survivors. Specify a specific bible study, workshop or gathering where the intention of the group is to pray with and for survivors. Promote the Denim Day Facebook page through your own Facebook page or the Facebook page of your congregation.